In most of our regular Rutgers-Eagleton Polls we usually have a few additional questions that do not make it into one of our press releases. In particular, we ask favorability ratings of a range of political actors but don’t always have a place to report them. Several things jump out at us immediately. First, while President Obama’s national job performance ratings are in the 40s at best, voters in New Jersey still feel more favorable about him than not. In fact, Obama and Gov. Christie have nearly the same favorability ratings here in New Jersey, an interesting dynamic in a state that is much more Democrat than Republican. 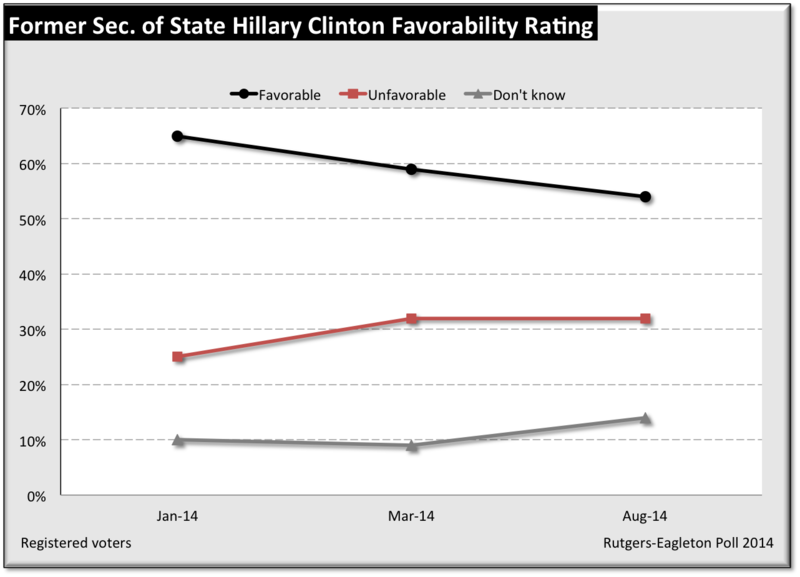 Second, Hillary Clinton has the highest favorability rating of this group (54%) – NJ voters are 22 points more favorable than unfavorable about her, versus a 9-point favorable margin for Christie and a 7-point margin for Obama. But Cory Booker has the highest net-favorable rating, +32 points, due mainly to the fact that few feel unfavorable toward him. But nearly a third have no opinion on Booker, a seemingly high number for someone who has been such a media darling. Third, while Christie of course is known by virtually every voter, and most have an opinion, the same cannot be said for the other two Republicans on this list. Lt. Gov. Kim Guadagno, despite having served with Christie for nearly 5 years, is virtually unknown. More than 7 in 10 NJ voters either have no opinion or don’t recognize her name. The quarter or so who do are split evenly, suggesting perhaps guessing as much as anything. The result for Jeffrey Bell, who is challenging Booker for the U.S. Senate seat, suggests he is maybe even less visible – almost 80% have no opinion, and the other 20% split evenly, as with Guadagno. A couple of interesting things appear when we examine some groups – particularly party identification and gender. There is no surprise in partisan reactions to Obama: 82% of Democrats feel favorable toward him while 83% of Republicans are unfavorable. This is polarization at its most stark. Clinton generates nearly as much variation – 83% of Democrats like her, while 68% of Republicans feel unfavorable toward her. But when we turn to Booker, we see somewhat less polarization, with 65% of Democrats feeling favorable, along with 35% of Republicans, “just” a 30-point gap, versus a 71-point gap in favorability toward Obama between Republicans (11% favorable) and Democrats (82%). Even Christie’s partisan favorability gap is 51 points – while 79% of Republicans like him, only 28% of Democrats do. So Booker seems to be in a somewhat different place compared to the others. When we look at the gender differences, we see some interesting results. On Obama, men are evenly split at 45%-45% but women are 12 points more favorable (52%) than not (40%). For Clinton, the gap is much larger. Men are favorable by a 9-point margin, 47% – 38%, but women show a 32-point net favorable rating, 59% – 27%. 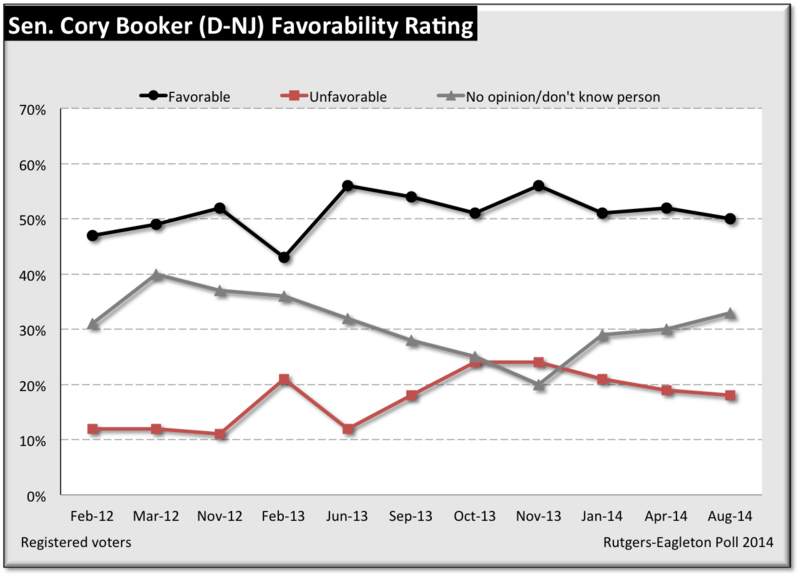 Booker, on the other hand, shows a different kind of gender gap in favorability ratings. Men (51%) and women (49%) have about the same level of favorability, but men a much more unfavorable (24%) than women (12%). Instead, women are far more likely than men to have no opinion on Booker. 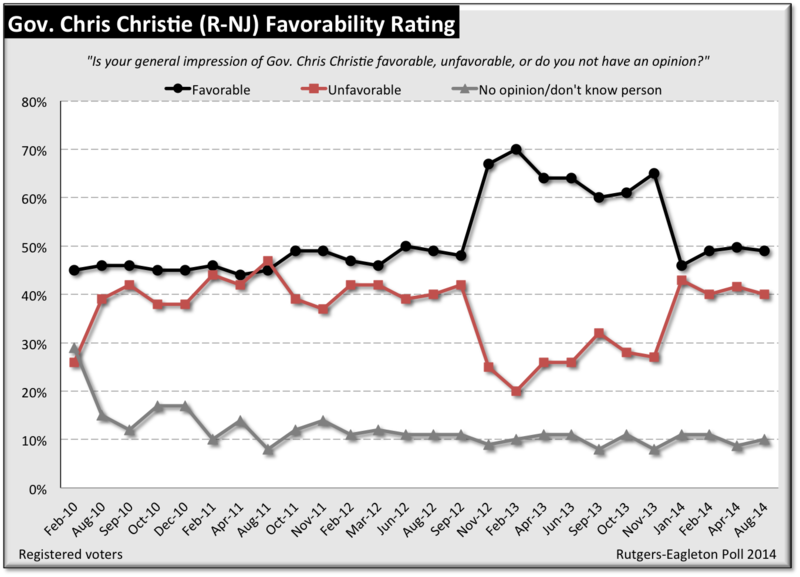 Unlike most Republicans, Christie’s favorable ratings show no gender gap at all of any kind. Men rate favorability at 50% favorable to 40% unfavorable, while women are 49% – 41% favorable toward Christie, no statistical difference between them. Finally, turning back to Guadagno and Bell, we see similar partisan dynamics between the two. While Republicans are of course more likely to be positive toward both of them, the key story is that even among Republicans, they are unknown, with more than 60% of GOP voters saying they have no opinion or don’t know either one. While Bell has just burst back on the scene after 30 years away, and thus we would not expect even Republicans to know him, the fact that they also do not know Guadagno, the state’s sitting Lt. Governor, is a sign of just how much Christie takes the spotlight and how little she has been visible even to her own partisans. We have asked some of these ratings regularly, so here are a few trend charts in case anyone is interested. This is true, but those polls are national. Our are NJ only, where voters are somewhat more positive about Obama than in many other states. Even so, this Rutgers-Eagleton Poll is from early August, nearly two months ago. Obama’s rating in New jersey may well be different by now. Gotcha. Thought you were looking at national numbers. But what we are reporting is NOT job approval ratings which means our numbers are not comfortable to the numbers you cite. 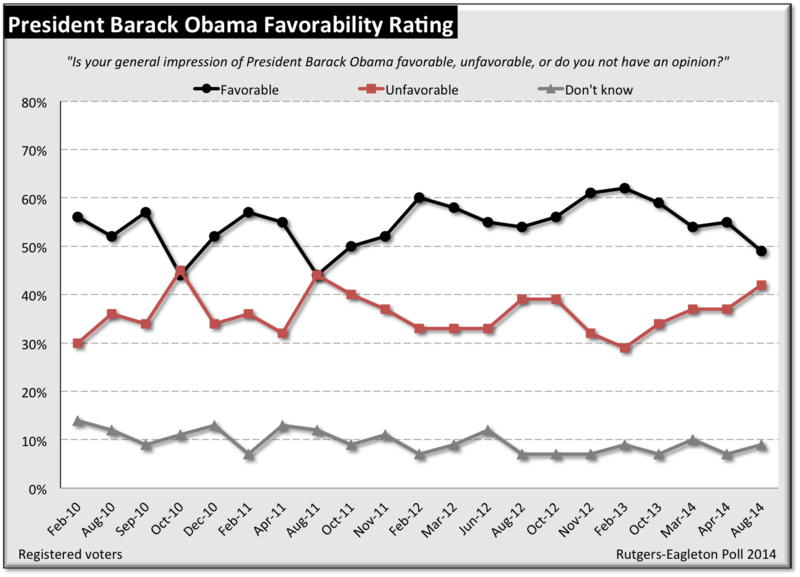 Instead we ask a favor ability question, how favorable or unfavorable people feel about Obama and others. It is not unusual at all to find the more people feel favorable towards of political figure than approve job performance. This has also happened with Governor Christie and others. Basically, favorability simply tracks whether people feel good or bad about someone. Thinking like a politician personally will still not being happy about the particular job that they are doing. That is probably what is going on with Obama. In any case, this is a good example of where you have to know the wording of the question in order to know if the questions can be compared.